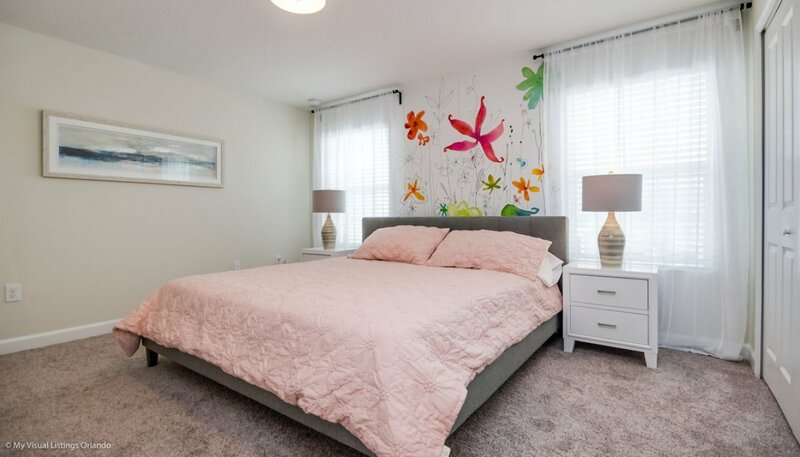 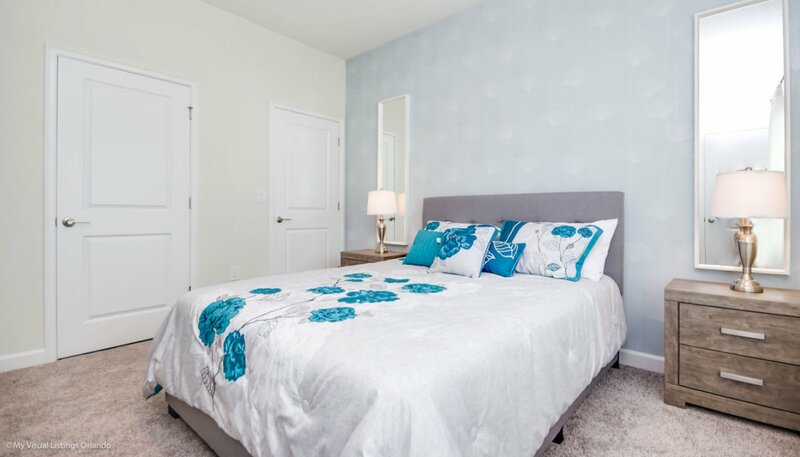 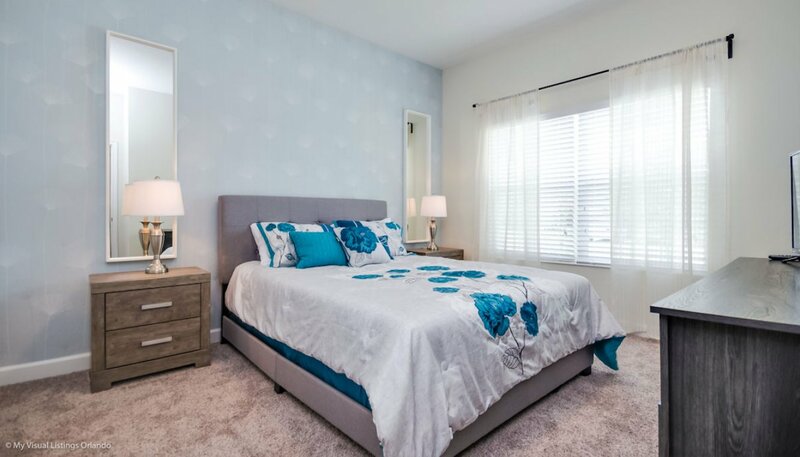 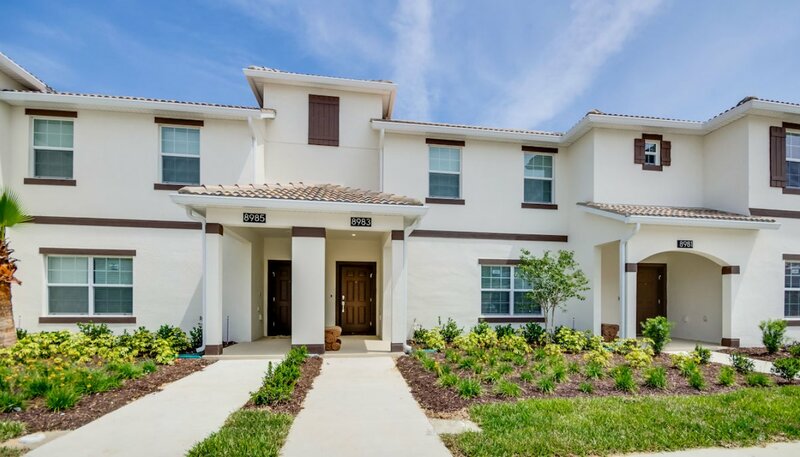 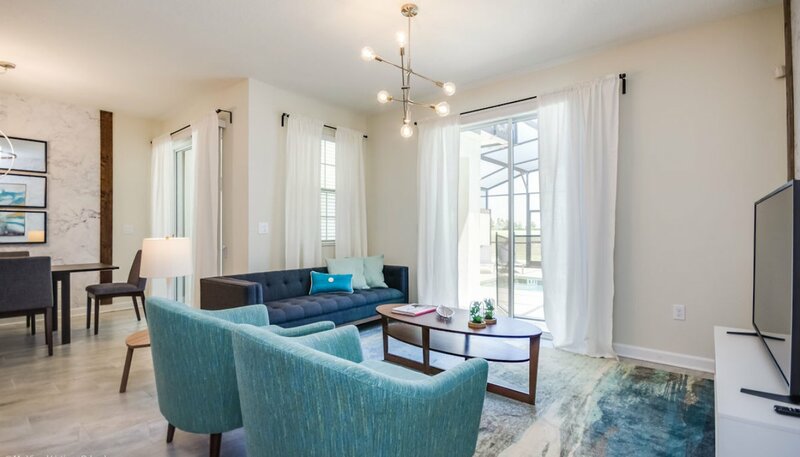 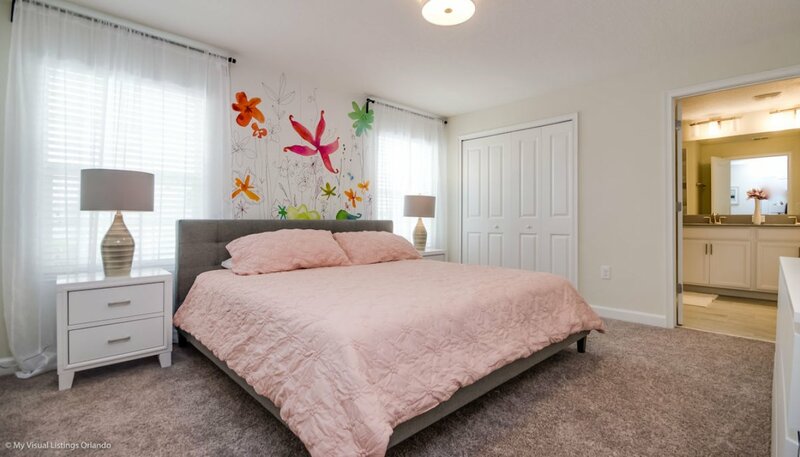 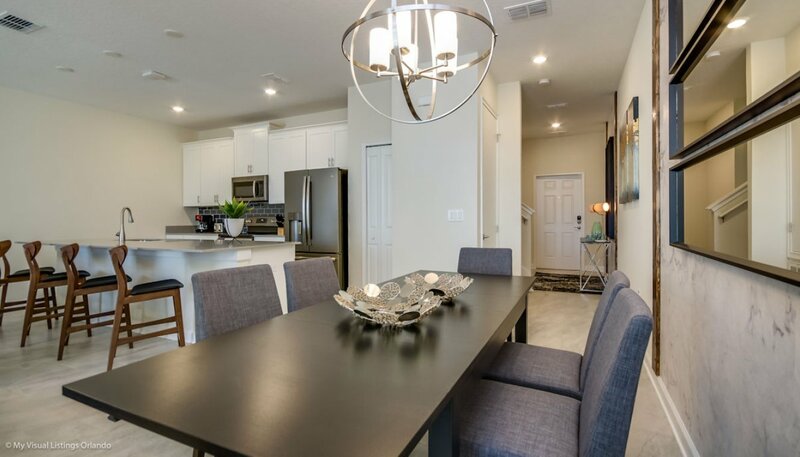 This stylish 4 bedroom, 3 bathroom townhome is a great choice for your family vacation base. 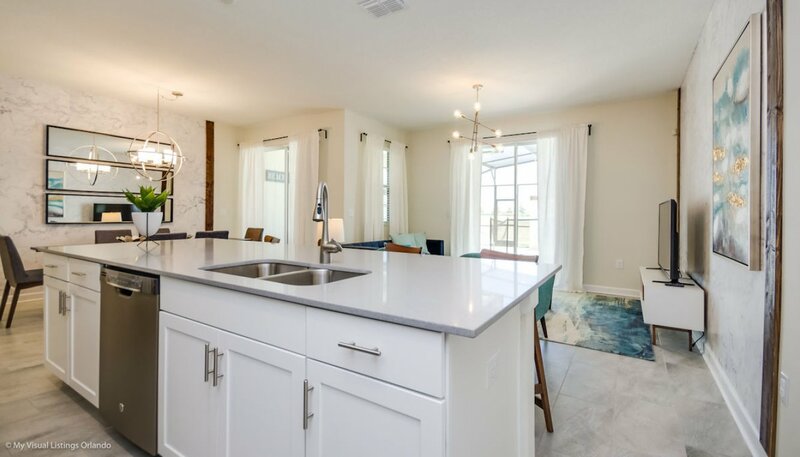 With an attractive open floor plan layout, modern luxury kitchen, LCD cable TV's throughout, plunge pool and private deck area this home offers just what you need for that at home feeling while on vacation. 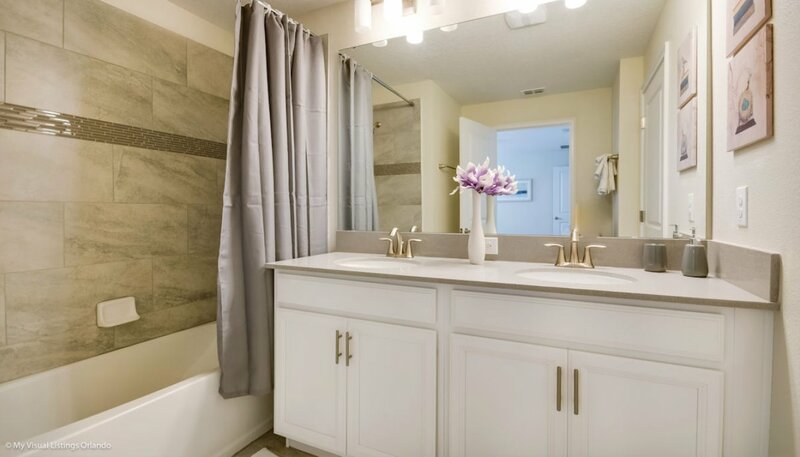 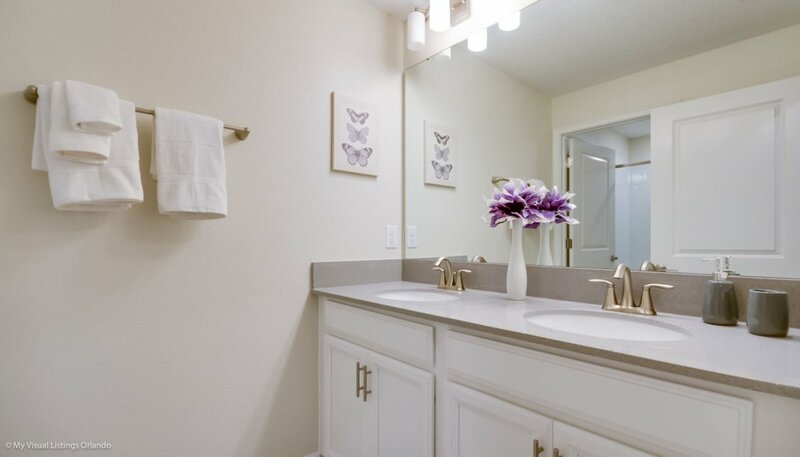 As you enter the home you are greeted with a fabulous tiled hallway leading off to queen bedroom 4 and adjacent bathroom on the right. 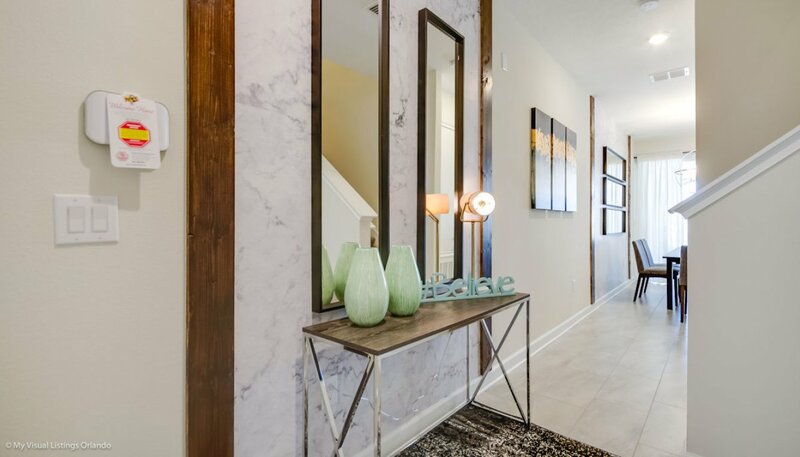 The hallway then leads past the stairs to the spacious open plan living room, kitchen & dining area beyond. 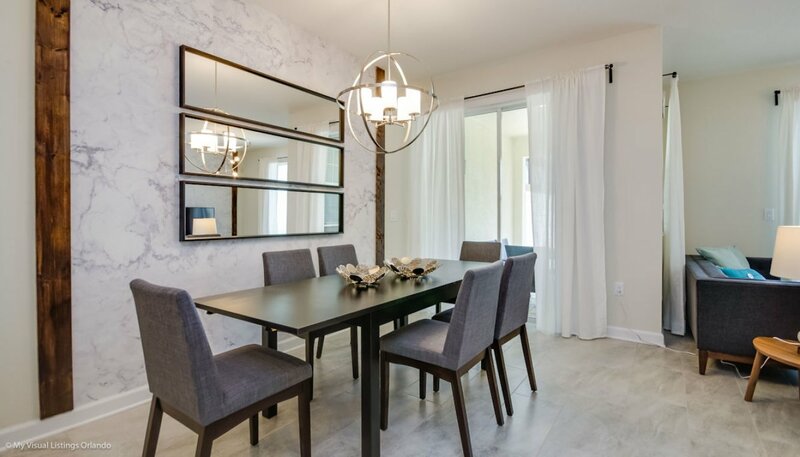 As you enter the main fully tiled living space, you find the attractive dining area with views onto the pool deck, offering a large dining table with 6 chairs and is ideal for large parties and formal dining. 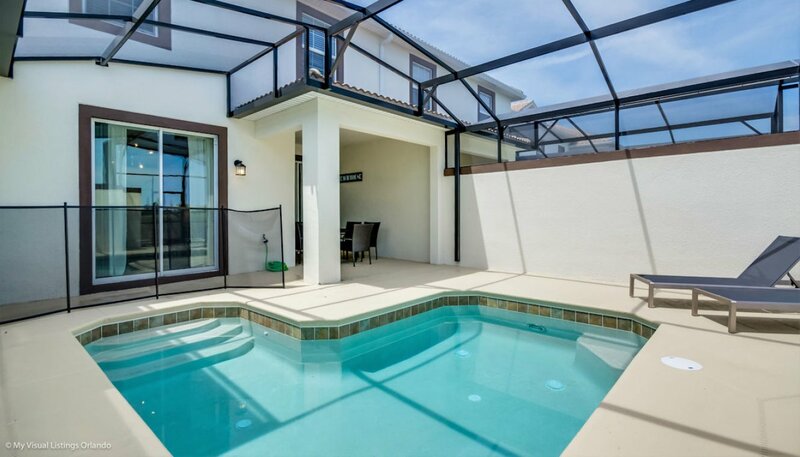 Sliding patio doors offer direct access to the pool deck. 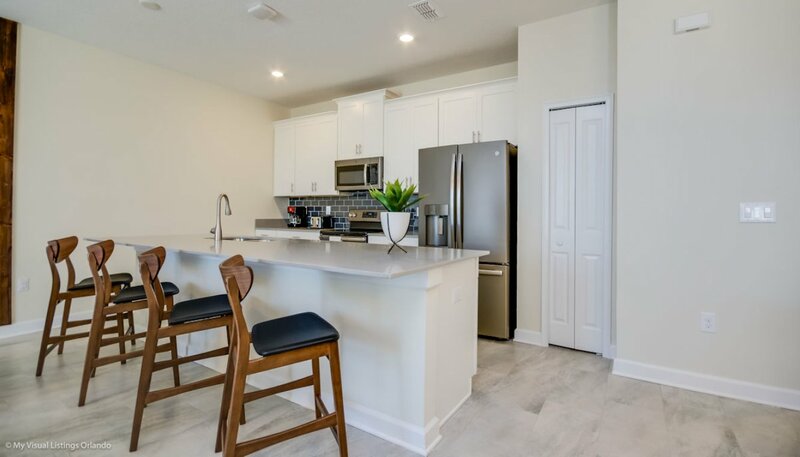 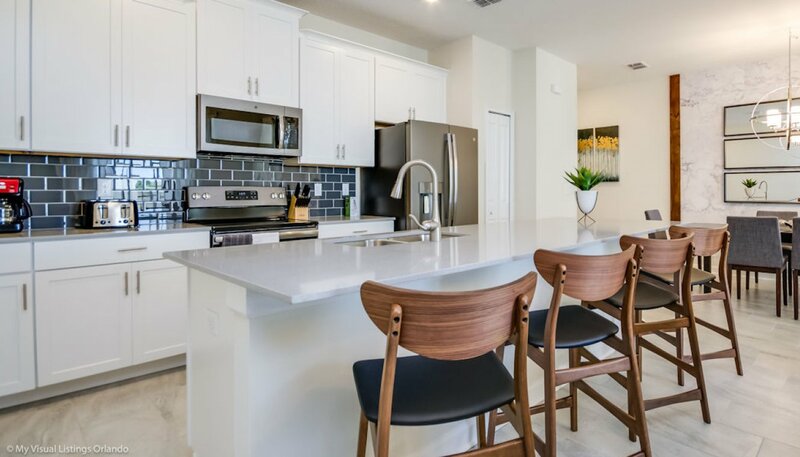 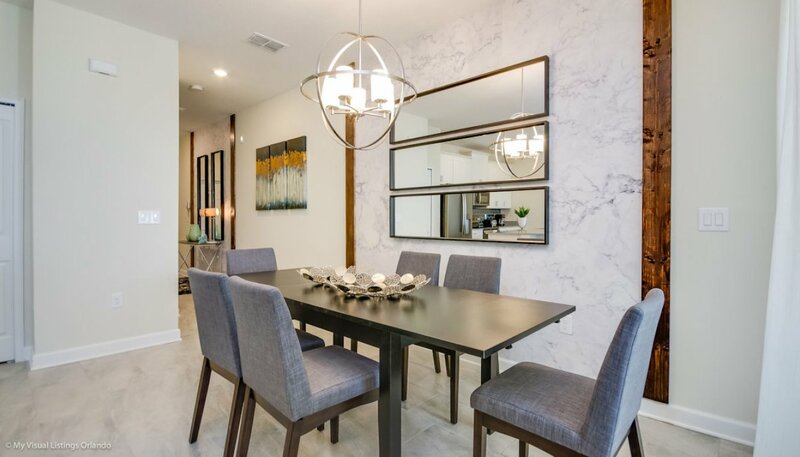 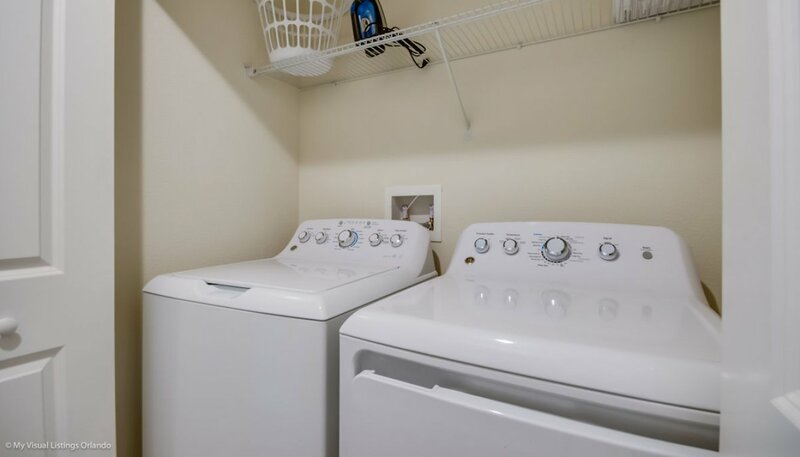 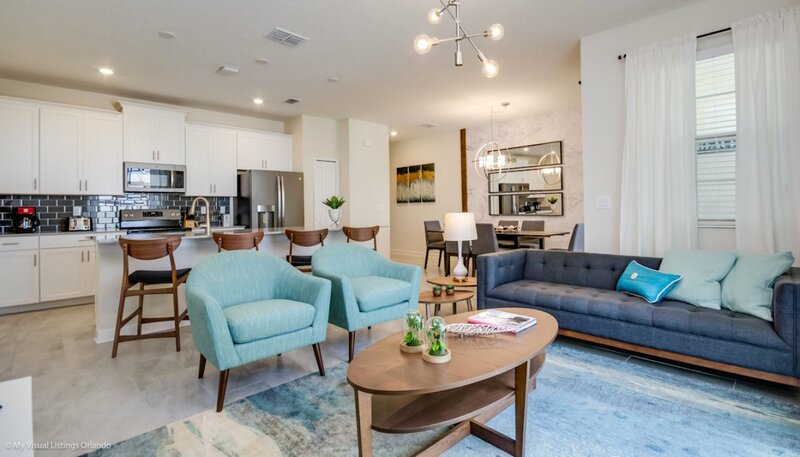 The luxury kitchen with granite countertops and quality stainless steel appliances has all the amenities including dishwasher, stove with oven, microwave, refrigerator & freezer with automatic water and ice dispenser, waste disposal, coffee maker and toaster. 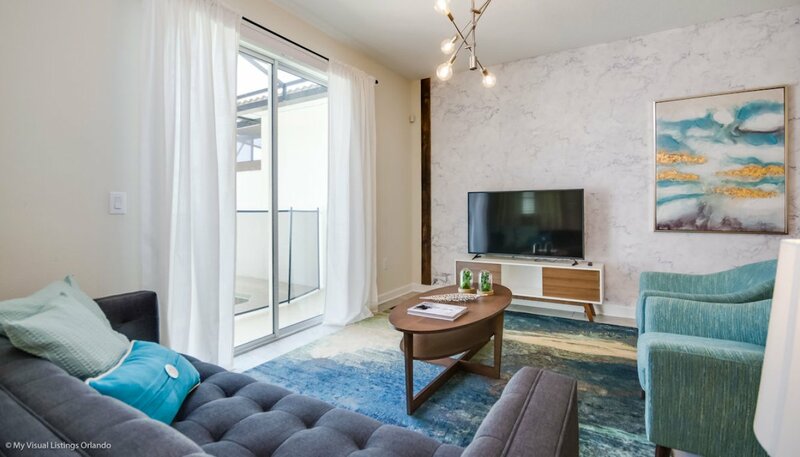 The spacious and attractively furnished living room with sectional sofa and 2 armchairs provide a comfortable space to watch the large LCD cable TV. 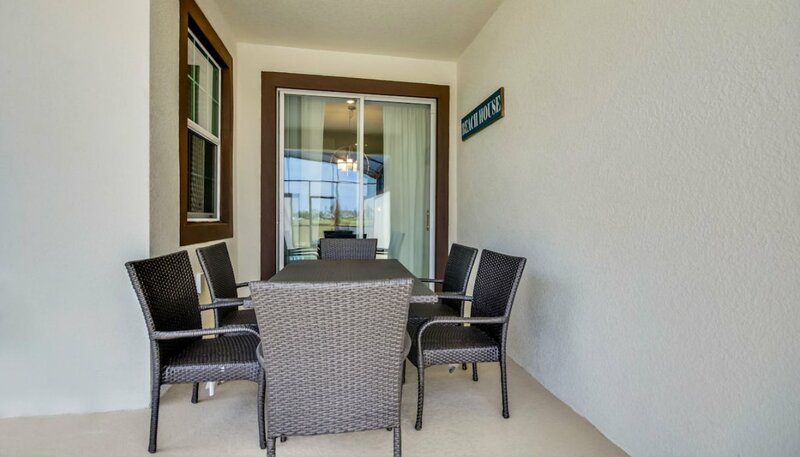 Sliding patio doors lead to the pool deck. 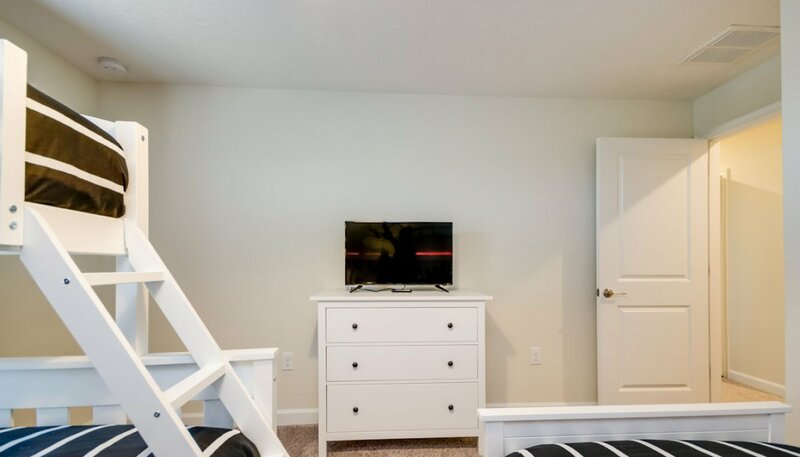 This bedroom with views onto the front gardens comes equipped with a queen sized bed with matching nightstands and chest of drawers with LCD cable TV above and built-in wardrobe. 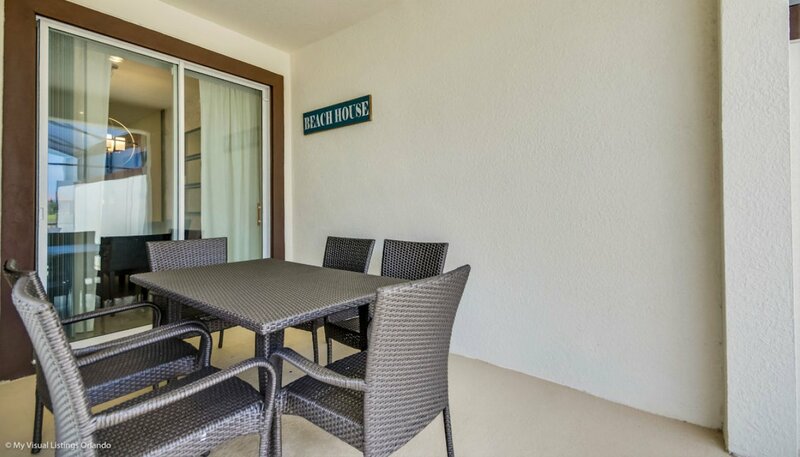 The L shaped plunge pool with north facing private enclosed deck has been provided with 2 sun loungers for your sunbathing comfort & a patio table with 6 chairs under the shady covered lanai. 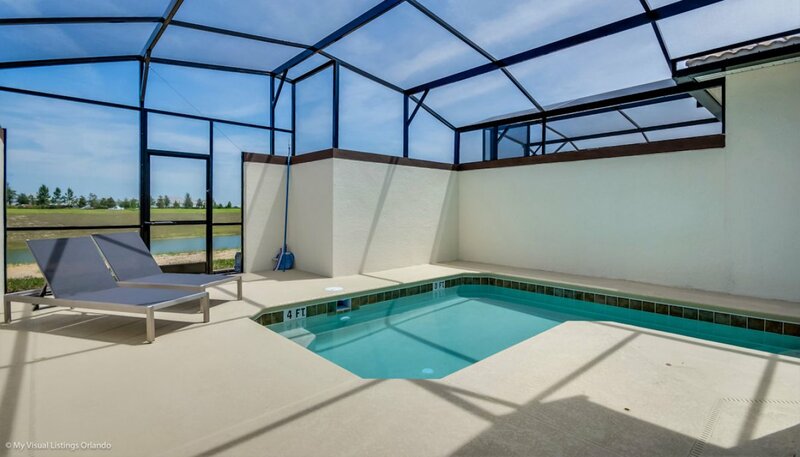 The pool area opens out to the rear onto a pond view. 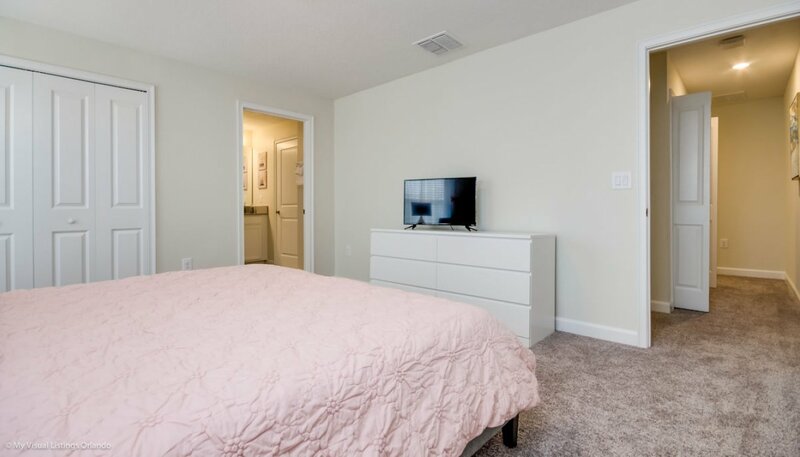 The large master bedroom with views over the front gardens has been furnished with a king sized bed, matching nightstands, chest of drawers with LCD cable TV above and large built-in wardrobe. 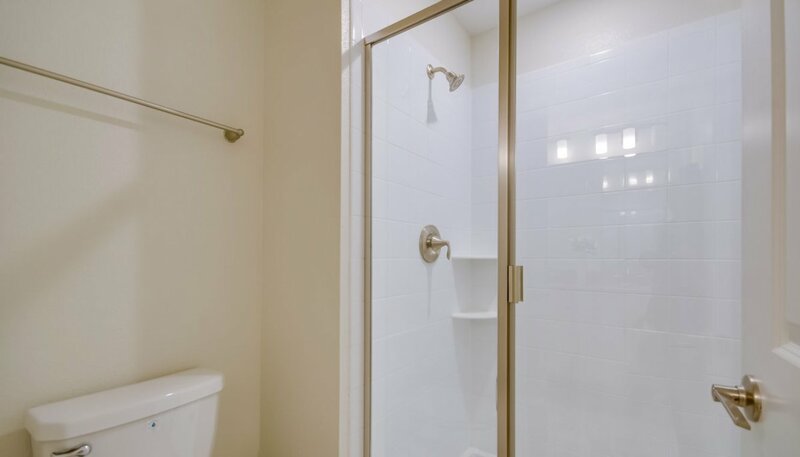 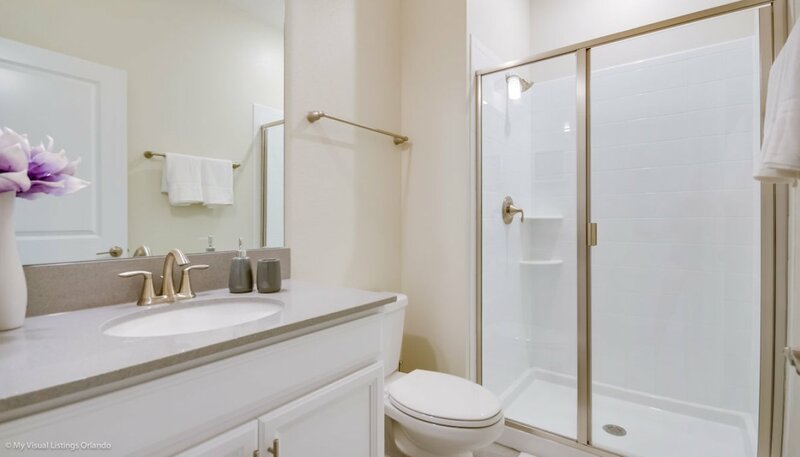 The connecting spacious ensuite bathroom has a bath with shower over, his & hers sinks and separate WC. 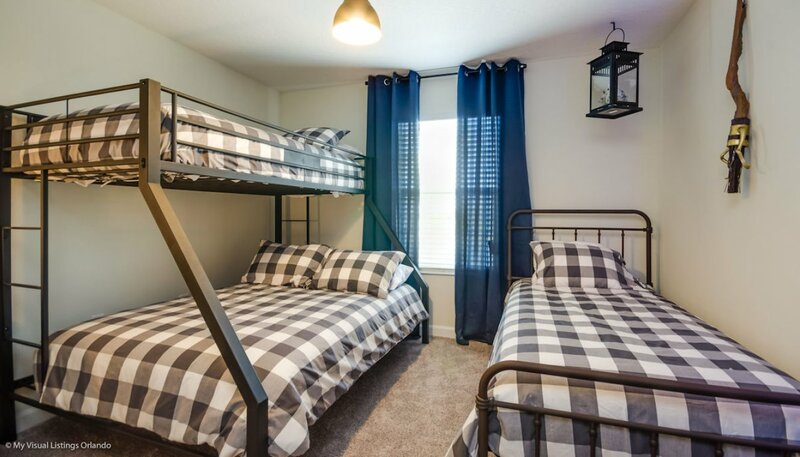 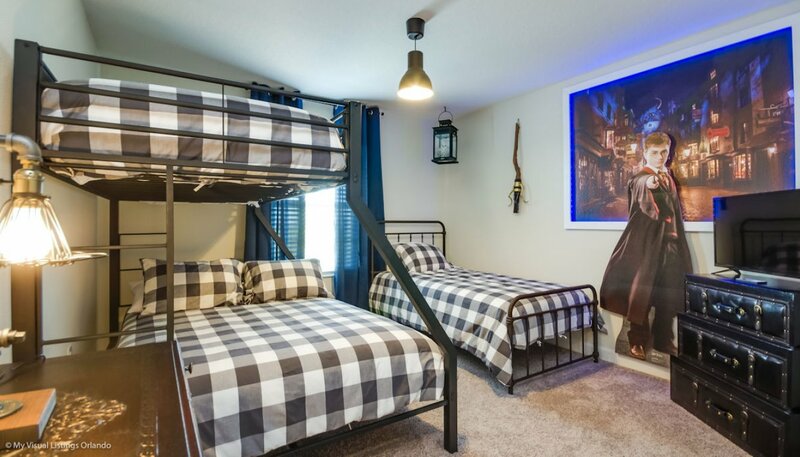 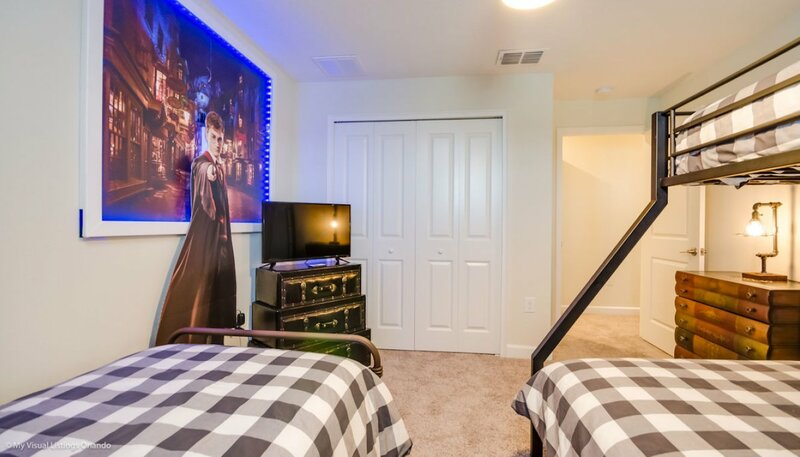 This Harry Potter themed bedroom comes equipped with a bunk bed (twin over full-size) and additional twin bed, with chest of drawers, LCD cable TV and large built-in walk-in wardrobe. 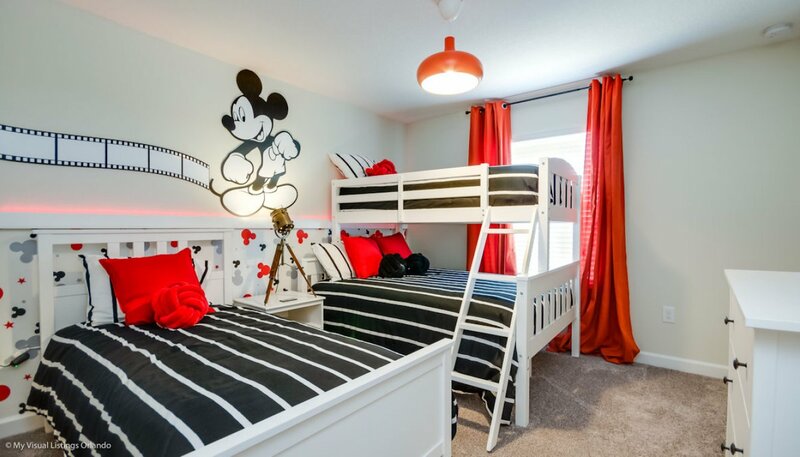 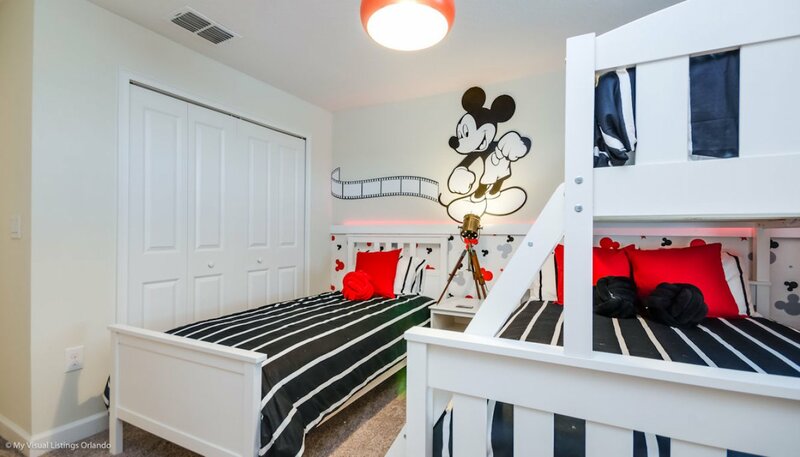 This Mickey Mouse themed bedroom comes equipped with a bunk bed (twin over full-size) and additional twin bed, with nightstand, chest of drawers, LCD cable TV and large built-in walk-in wardrobe. 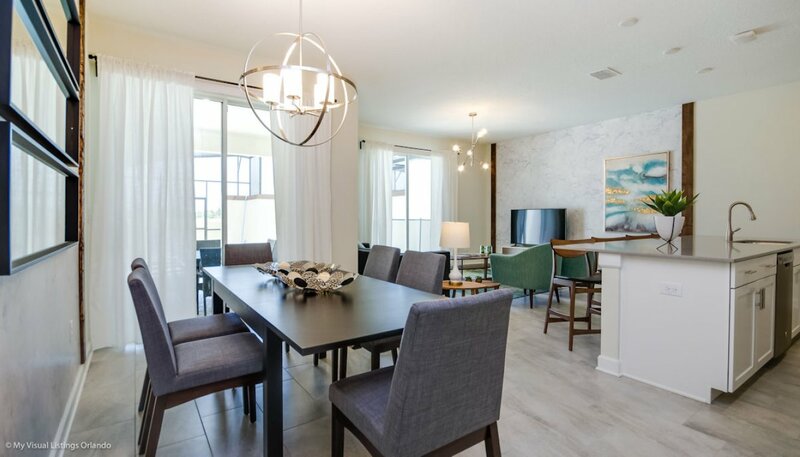 There is also the Berry Town Centre just 10 minutes up the US27 where you will find even more shops, bars & restaurants to choose from and a Walmart another 7 minutes further north on the US27.